First opened in 1997, Crown Melbourne is a large integrated resort and has Australia's largest casino, three hotels, function rooms, award winning restaurants and world-class shopping and entertainment facilities. It is a significant driver of tourism within Australia, particularly in Victoria. Crown Melbourne has a wide variety of retail, entertainment and food and beverage offerings. There are more than 40 retail outlets and around 70 restaurants, cafes and bars which provide a large and diverse entertainment offering to cater for a significant number of visitors. This image belongs to the travel and nature stock photo library. This stock photo of Crown Casino before Sunrise is available for licensing for commercial and editorial uses including websites, blogs, books, magazines, brochures and advertising. Restrictions may apply for images which contain third party copyrighted material or sensitive subjects. Photos of artwork are for editorial use only. 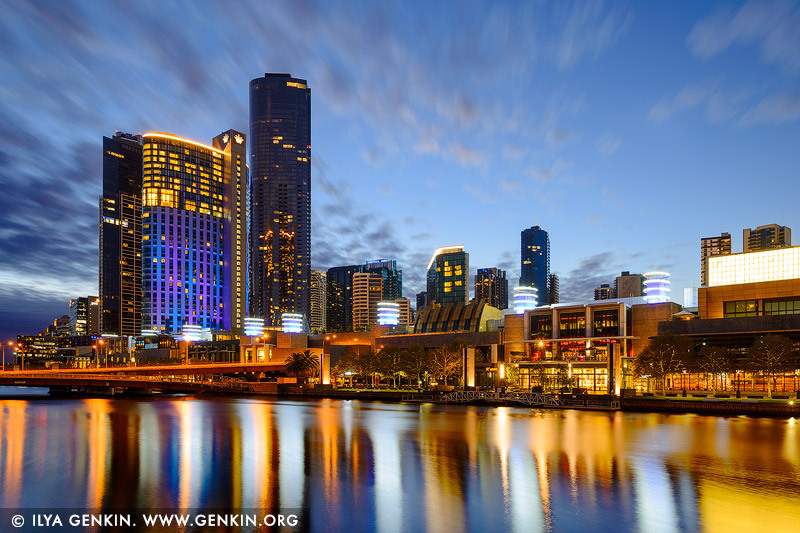 This image id AU-MELBOURNE-0039 of Crown Casino before Sunrise, is copyrighted © by Ilya Genkin. This is not a public domain image.